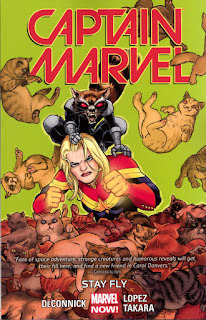 After a long opening arc, Carol Danvers spends Captain Marvel Vol. 2: Stay Fly rocketing around on a variety of adventures. Joining her is Tic, the mysterious alien girl who put the previous arc into motion, and I suppose I should start off mentioning how much I dislike her continued appearance in this title. The Higher, Further, Faster, More trade introduced a cast of interesting aliens and the most annoying of them ended up traveling with Carol Danvers past that story. It’s a rare misfire for Kelly Sue DeConnick, who previously used the little girl Kit as an adorable side character. Tic (which I noticed is “Kit” backwards phonetically) is Space Jubilee when Carol needed Space Shadowcat instead. Tic is thankfully unable to drag the comic down too far, as the first story here brings back a better previous guest character: Rocket Raccoon. He had previously mentioned that Carol’s cat, Chewie, was an alien called a “Flerken” after it tried to attack him. It’s revealed that this wasn’t a joke and that Chewie is a portal-generating alien who has just laid a clutch of eggs. Because Flerkens are so rare and valuable, a living ship arrives to capture Chewie and her “Fler-Kittens” to exterminate the species forever. The ship is sadly not given more explanation despite an excellent depiction under the pen of guest artist Marcio Takara. This is only an unconfirmed theory, but shortly after this arc was published, the Guardians of the Galaxy encountered the home planet of the Symbiotes, and the ship is reminiscent of Venom and others of his ilk. Having a guest star like Rocket is obviously a draw for readers of Guardians of the Galaxy to pick up Captain Marvel, but he’s used extremely well in this. He had a rivalry with Chewie already established and the two go through an arc of their own, possibly ending up in love by the end. DeConnick also uses a countdown theme in each of the issues, making the two parts mirror each other without feeling like a retread. Another guest star invigorates the following issue as Lila Cheney gets mixed up in Carol and Tic’s voyage home. Lila is from the original New Mutants era and has the unusual ability of “long-range teleportation” -- unlike Nightcrawler’s short-range jumps, she can only teleport over lightyears of distance, often unwillingly. This ability has landed Lila in a number of sticky situations over the years, and one trip made long ago led to her getting unwittingly engaged. She ends up on Carol’s ship while trying to escape the marriage; Carol and Tic return with her to work the situation out, leading to the issue’s dialogue conceit. Everyone on the planet Aladna speaks in rhyme and the visitors have to play along. DeConnick doesn’t have them stick to a certain rhythm, which simplifies the matter; they just have to rhyme everything they say. The issue plays up the silliness; the prince wears Ziggy Stardust-style eye make-up while his father is clearly Fat Elvis. The end annoyed me as it appeared Tic was going to leave the book for the second time in two issues, only for it to be undone yet again. Issue #10, which is Carol Danvers’s 100th solo issue (under various names), is an annual-sized tale told through letters from home. The story revisits Grace Valentine, a villainous scientist obsessed with being more famous than Captain Marvel, after her original story in the first volume of the title. Valentine's unhinged plan ends up with her taking control of New York City’s rats and sending them against Carol’s friends. Kit, Spider-Woman, and Jim Rhodes tell the story in three chunks, with Spider-Woman’s chapter having a hilarious flashback to the time she tried to have Carol incinerate a rat in their apartment. This issue reconfirms the romantic pairing of Carol and Rhodey that the first issue set up. It’s a shame that Rhodey didn’t go off to space with Carol and Venom to join the Guardians; his Iron Patriot career went as well as his Iron Man 2.0 tenure. Carol convinces Lila to take her back to New York for one night to check in on Tracy, her crotchety mentor who has fallen into a deep illness. This leads to Carol fighting both Valentine and June Covington, a mad scientist she had previously encountered in Avengers Assemble: The Forgeries of Jealousy. David Lopez illustrates a fantastic page of Covington’s glasses multiplying sinisterly while Carol is knocked out by her germs. Carol hasn’t had the best rogues gallery, so these two fearsome foes are a welcome addition to the cast. She’s able to defeat them with what might be the strangest team-up I’ve read in ages; it makes sense in retrospect but it’s still baffling. If I spoiled it here, you wouldn’t believe me. There’s a sense that, much like the previous volume of Captain Marvel, DeConnick’s plans for Captain Marvel Vol. 2: Stay Fly were modified due to scheduling issues. Carol had to be in space for her tenure in Guardians of the Galaxy, so after she comes home for one issue, she returns to them ... only to go home four issues later at the end of the next arc. But many of these issues can be overlooked as Carol makes for such a great protagonist. She has deep personality flaws, like her hotheadedness, but she has a rich history to explain why she’s all screwed up. The new Captain Marvel and the Carol Corps seems to be the book DeConnick has wanted to write since Carol upgraded her rank, so Stay Fly is just a step on the road towards that end. Next week, Indie-Pendence Month returns with a look at a celebrated recent take on the GI Joe mythos. I'm not sure if I'll ever read a Captain Marvel book, but it just reminds me that DC's Captain Marvel isn't Captain Marvel anymore, even though I do like Shazam but CM was just catchier.